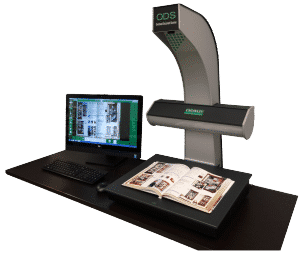 Scannx, a leading developer of cloud-based document scanning and delivery solutions for libraries, has paired their software with the Crowley-manufactured ODS overhead book and document scanner and is now available from firstcoast. The pairing will be offered to the public as the ODS 100. Firstcoast is a market leader in the distribution of book, microfilm, photographic and document scanners and cameras and also provides world-class digitisation services for government, private and public institutions. The ODS 100 will debut in Booth 3059 at the 2018 American Library Association Annual Conference which will be held June 21-26 in New Orleans, LA. Come see the new ODS in Booth 1943.